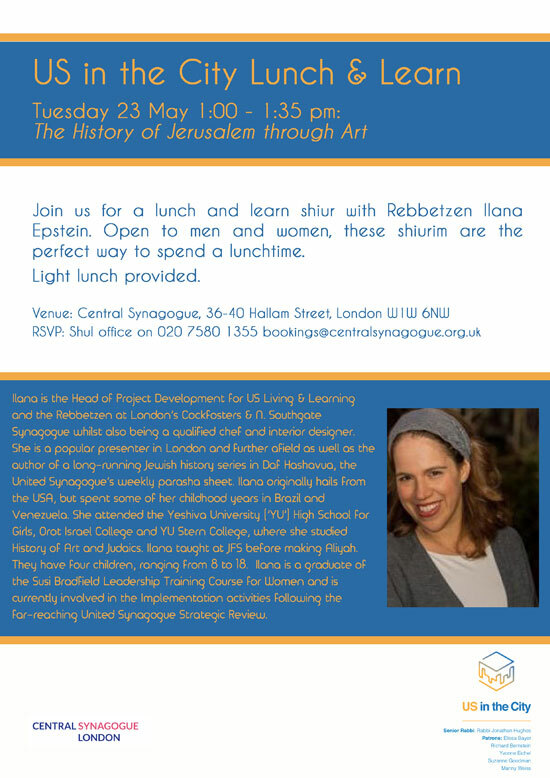 Join us for a lunch and learn shiur with Rebbetzen Ilana Epstein. Open to men and women, these shiurim are the perfect way to spend a lunch hour. Ilana is the Head of Project Development for US Living & Learning and the Rebbetzen at London’s Cockfosters & N. Southgate Synagogue whilst also being a qualified chef and interior designer. She is a popular presenter in London and further afield as well as the author of a long-running Jewish history series in Daf Hashavua, the United Synagogue’s weekly parasha sheet. Ilana originally hails from the USA, but spent some of her childhood years in Brazil and Venezuela. She attended the Yeshiva University (‘YU’) High School for Girls, Orot Israel College and YU Stern College, where she studied History of Art and Judaics. Ilana taught at JFS before making Aliyah. Ilana and her husband have 4 children, ranging from 9 to 19. Ilana is a graduate of the Susi Bradfield Leadership Training Course for Women and is currently involved in the Implementation activities following the far-reaching United Synagogue Strategic Review.